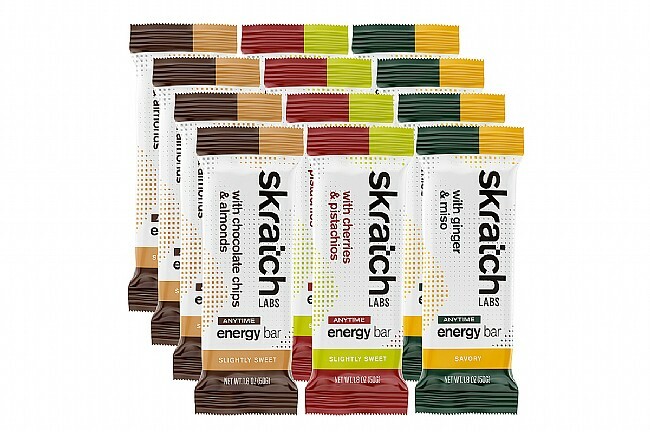 The Skratch Anytime Energy Bars are powerful enough for endurance workouts but tasty enough for a snack any time of day. They're made with real ingredients like oats, nut butter, sea salt, brown rice crisps and quinoa crisps. Skratch doesn't like putting extra junk in their bodies and they don't want you to either so these are free from anything artificial or unnecessary such as artificial sweeteners, coloring or flavoring agents. The Mixed Box of 12 includes the following flavors: Chocolate Chips & Almonds (4), Cherries & Pistachios (4), and Ginger & Miso. Non-GMO, vegan, dairy free, kosher (Pareve) and gluten free. Cholesterol Free, Zero Trans Fats, Low Sodium (Chocolate Chips & Almonds, Cherries & Pistachios).